Four days ago, 606 players put up the $1,500 buyin to play this $1,500 Stud Hi-Lo event. It was supposed to be wrapped up within three days, but our final two players tangled up in a tug of war last night that couldn't be called one way or the other. They were summoned back to the ropes today, and it took just less than an hour for Mike Sexton and Chris Viox to settle the score. The crowd was certainly pro-Sexton here today, but now that they've cleared out, we can see a pretty stout contingent of Chris' Viox cheerleaders still standing in a huddled mass. They're chanting something we can't quite make out at the stage, and flash bulbs are popping as Viox is holding tight to his first gold bracelet, posing for photos that will become WSOP history. This event was the first event since the November Nine to see play halted heads-up as the hard stop forced the two players to return to the felt today to crown one of them champion. 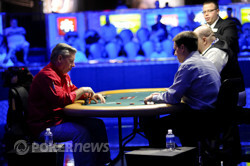 Mike Sexton held a significant chip disadvantage as they restarted, and he was whittled right down to the nubs early on. Viox had Sexton down to just 240,000 at one point but couldn't close it out as Sexton rivered two pair to double back to life. He doubled again to get close to a million chips a few hands later, but that's as close as he'd get. Just a few hands after that double, it was Viox rivering the two pair to crush Sexton's comeback bid. 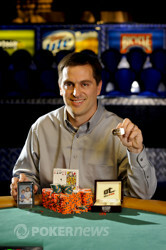 So then, it's Chris "PiMaster" Viox who claims this 25th bracelet of the 2011 WSOP. 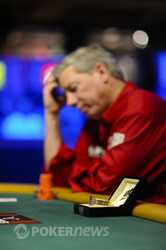 Outlasting a field of 606 players is worth more than $200,000 and the bragging rights that have no price. 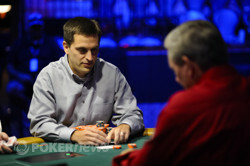 Viox is a new bracelet winner, and we join Sexton in congratulating him on that achievement. Chris Viox denies Mike Sexton another bracelet. Both players had a low draw with one to come, and Sexton's pair of eights were still ahead. There was a quick discussion about who should peel first, and Viox ended up flipping over the to take the lead with two pair. Sexton needed to make a low to catch half, or make two pair or better to scoop the double. He squeezed carefully for just a second, but once he saw paint, he knew it was over. The landed on the felt for Sexton's seventh street, and it's not going to do it. Viox slammed his fist down on the felt and took a moment to huddle inside his own arms and soak in what just happened. The two men shook hands, and Sexton congratulated the new champ on joining the bracelet winners' club. With that, Sexton has been cut down in second place, good for $123,000. Mike Sexton has folded on third street three consecutive hands, and he's been forced out on fourth street in at least three more. He's been reduced down to about 520,000 in that attrition. After repeated folding before fourth street during the last few minutes, Mike Sexton has shown Chris Viox a few nines while mucking his cards. After yet another useless nine, Sexton jokingly asked the Tournament Announcer "can we make nines wild from now on?" With a short stack, Sexton will need those nines to start turning into eights soon if he hopes to capture his second WSOP Seven Card Stud-High Low Eight or Better bracelet here today, some 22 years after winning his first. Chris Viox showed the for the bring-in, and he called the completion from Mike Sexton and the . 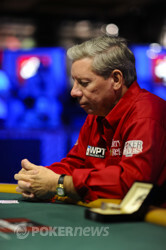 Sexton bet his lead on fourth street with two diamonds showing, but he checked on fifth. Viox checked it back, and Sexton checked again on sixth. Viox took his cue to bet, and Sexton called. On seventh, Sexton check-called one last bullet, making sure for a just a couple moments before he plunked most of his chips into the pot. Viox could only reveal for a pair of threes, and Sexton flipped over for the winning pair of sevens. He may have been a bit surprised to scoop that one up, but it's done his stack well, boosting him to 930,000 and back into the fight once again. He's still down about 2:1 in chips, though. Chris Viox brought it in with the up, and Mike Sexton completed with the . Viox check-called a bet on fourth street, but he couldn't call a big bet. The 120,000 on fifth street was enough for Sexton to take it right there, clawing back to 520,000 after dropping a few small pots previous. Chris Viox brought in with his up, Mike Sexton completed with his and Viox made the call. Viox led out with a bet on fourth street and Sexton called. Sexton checked on fourth street, and then called after Viox bet 120,000. On sixth street again check-called a bet by Viox. Seventh street saw Sexton push all-in and Viox call him down. Sexton revealed the for a flush, while Viox turned over a and two unidentified cards, good for an A-2-3-6-7 low and a chopped pot. Chris Viox brought it in with the showing, and Mike Sexton completed with the . This was the one. 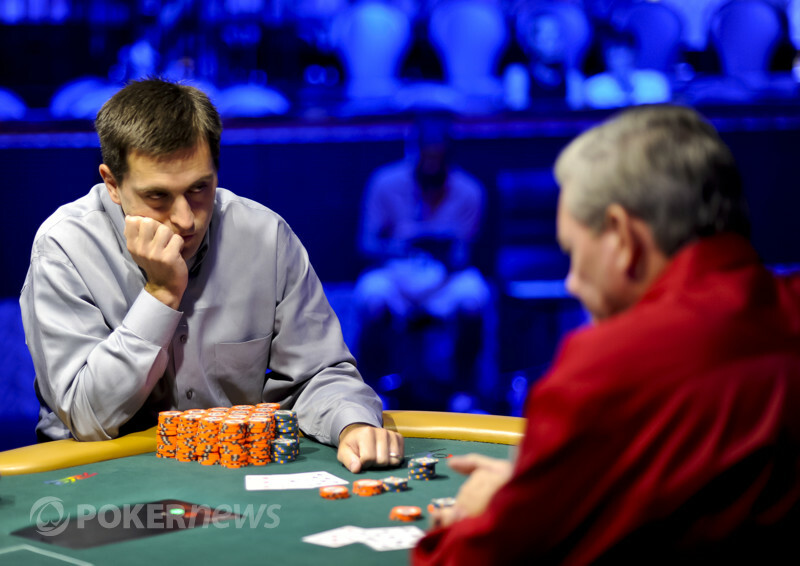 Viox raised, Sexton reraised, and the last 240,000 of his chips ended up in the pot. Viox peeled his seventh card first, the , and Sexton needed to make two pair or better to stay alive in this thing. He didn't waste any time, ripping it over like a Band-Aid: the . That's queens up for Sexton, and it's his double up. He's back to 570,000 -- not done yet. Chris Viox is the bracelet winner in event 25.